The PADI Deep Dive Course is ideal for enthusiastic divers like you who are curious about the mysteries of the deeper depths. Many interesting marine creatures can be found in wrecks that go below 18 meters/60 feet which are not normally found in shallower areas. When you enroll in this course, you are required to go through the e-Learning course materials to understand the important theories of diving which you can do at home and at your own pace. After this, you can proceed to the one-day course where you will learn how to manage your gas supply, buddy contact procedures, and buoyancy control. Upon completion of the PADI Deep Dive course, you will become adept in specialized deep diving equipment; as well as deep dive planning, buddy contact procedures, and buoyancy control. The course will also equip you to manage your gas supply, deal with gas narcosis, and other safety considerations. You will be able to explore deeper dives sites up to 40 meters (130 feet) with your instructor. After paying the fee, you will get an email from PADI within 24 hours with a code that you can use to make your own account on the PADI website. This will give you access to five sections of various interactive reference materials. There be a final and table exam at the end of the e-Learning course to determine if you’re ready for the next phase of training. When you pass the e-Learning, you can choose your preferred date and time so you can start diving. 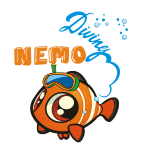 We will meet you at the Nemo Diving Center on the agreed schedule where you will spend the first 30 minutes filling out the forms and fitting your equipment. Our PADI-certified instructors will accompany you to the beach of Dukes Hotel in Dubai to go on four adventure dives to apply everything you've learned from the online training materials. We strongly recommend completing the e-Learning materials first to better prepare you for the actual dive session.